‘Most Secure Coin In The World’? 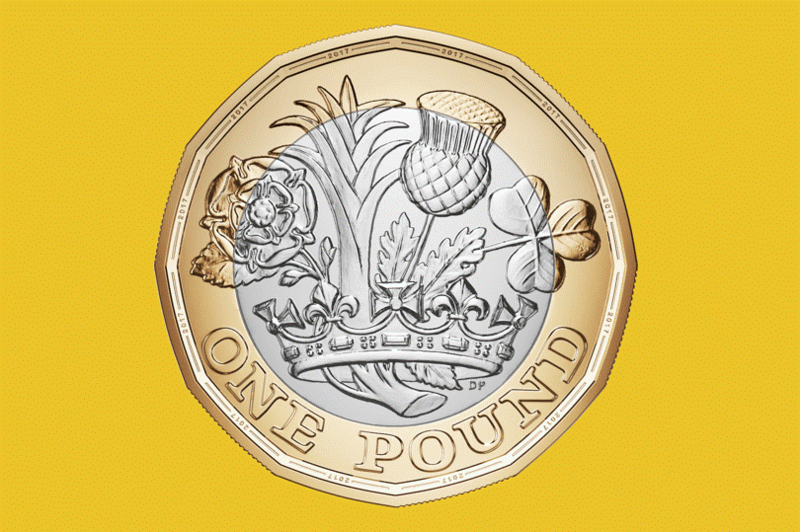 – New pound coin ‘most secure coin in world’? The UK launched what is being touted as the “most secure coin in the world” yesterday – the day before Brexit day. This post deals with the disposal of spent fuel from nuclear power stations, and whether our fears concerning it are justified. You can also read Part 1 and Part 2. 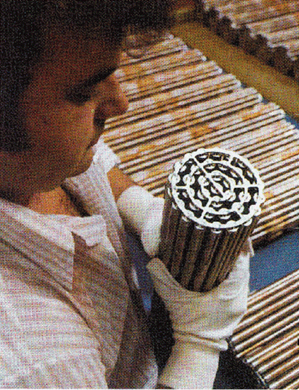 Technician handling an unused CANDU reactor natural uranium fuel bundle. Note the absence of any radiation protection. Nuclear fuel typically consists of either uranium dioxide (UO2) or a mixture of UO2 and plutonium dioxide (PuO2), commonly known as MOX (mixed oxide). The uranium can be natural uranium, containing only 0.7% of the fissile uranium-235 isotope, or it can be enriched uranium containing up to 5% of uranium-235. Uranium oxide fuel is only mildly radioactive and can be handled without any special precautions, as the accompanying illustration shows. MOX fuel is somewhat more radioactive, but not dangerously so . This was my first climate change conference and I had a great time. To hear the full talk by any of the speakers go to the Heartland.Org site here. The most memorable statement is from Myron Ebell. Three U.S. elections “have turned on climate issues.” These are 2000, 2010, and 2016. In 2000 Al Gore lost because he lost West Virginia. This “was due entirely because someone named Buck Harless put,” in every voter’s mailbox a study he commissioned showing the effect on West Virginia’s coal industry and economy of Al Gore’s proposed policies. The 2010 election was turned by the Waxman-Markey cap-and-trade bill, which caused the House Democrats to lose 20 seats and making the House of Representatives Republican. Finally, in 2016, climate change and the fossil fuel industry were explicit issues and Clinton and Trump were on opposite sides. The pro-fossil fuel side won the key fossil fuel states of West Virginia, Pennsylvania, Ohio, Tennessee and Kentucky. COLD WEATHER KILLS MANY MORE PEOPLE THAN HOT WEATHER. This trend is true in cold and also in warmer climates. Excess Winter Mortality is the number of people who die in the four Winter months, as compared to the 4-month average for the non-Winter months. Excess Winter Mortality globally is about 2 million people per year, including about 100,000 per year in the USA and up to 50,000 per year in the United Kingdom. Excess Winter Mortality rates are high even in warm countries like Australia. Paradoxically, rates of Excess Winter Mortality are sometimes greater in warmer climates than in cold ones, probably because people in cold climates adapt better to cold weather. President Donald Trump will issue a sweeping “energy independence” executive order today to dismantle signature global warming policies put in place by the Obama administration. False Precision: In their early education, many students of science faced the problem of significant numbers (digits). A useful rule of thumb was that the chain was only as strong as its weakest link. In measurement, the less precise instrument making the measurements determines precision of any dataset representing the measurements. A mathematical operation does not add precision to the instruments, or the dataset. For example, as discussed in the January 21 TWTW, the widely used Automatic Surface Observing System (ASOS) instruments at airports have a precision of plus or minus 1 degree C (1.8 F, correctly, 2 F). Surface datasets using these measurements cannot be more precise than these instruments. Yet, routinely, some government agencies report data, after mathematical manipulation, with far greater precision – to one-hundredths of a degree C. Such precision is false. Writing in the non-conservative Boston Globe, columnist Jeff Jacoby gives a simple illustration on how small errors in measurement can compound in a computer model with many small errors. Any assumption that the errors will cancel each other out needs to be demonstrated. However, in the reports of the UN Intergovernmental Panel on Climate Change (IPCC) and its followers, such cancellation of errors is not demonstrated.